The Mazer Cup International 2013 took place in Boulder Colorado over three days in March. Nearly 500 homemade and 350 commercial meads were assessed by AHA/BJCP sanctioned judging panels, with medals awarded in 17 categories based on sweetness, fruit or spice additions and/or barrel treatment. This was my first sanctioned judging event and my first mead judging event. My limited experience with mead consists of few dozen samples from a half-dozen countries as well as a basic understanding of wine making, enough to translate to mead making. 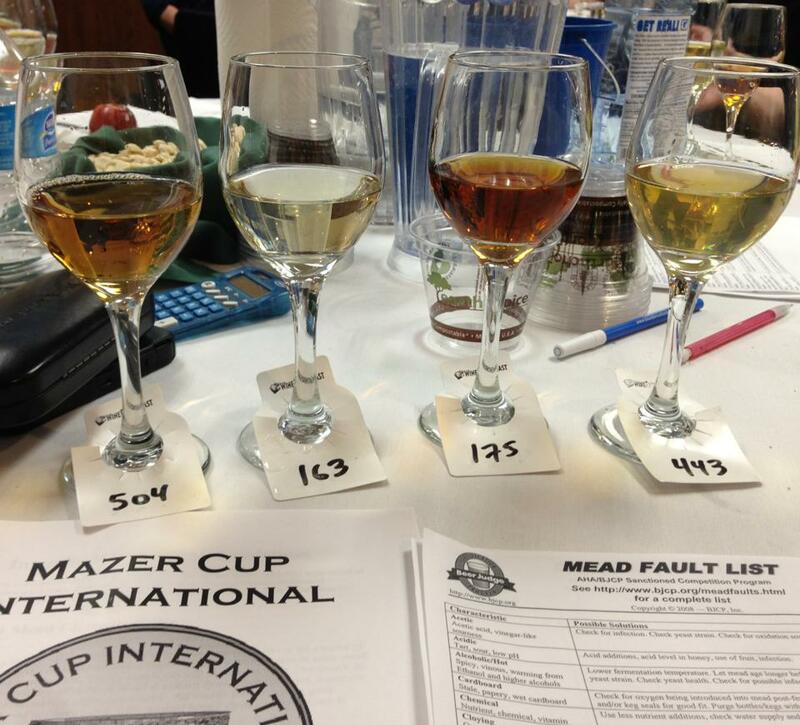 For both home and commercials competitions, the Mazer Cup uses the 2008 BJCP Mead Style Guidelines for evaluation. Entrants must specify carbonation level (still; pétillant; sparkling), strength (hydromel; standard; sack), and sweetness (dry; semi-sweet; sweet). Entrants in Other Fruit Melomel, Metheglin and Open Category Mead must specify special ingredients and treatments (fruit, spices, oak treatment, etc.). For the home competition I was seated for a short panel of Traditional Mead Semi-Sweet, and for the commercial competition I evaluated Specialty Open Category – Sweet and Varietal – Semi-Sweet, including a mini Best-Of-Show in each to determine category medals. The Specialty Open Category – Sweet meads I judged were a mix of treatments and additions: oak and bourbon barrels, berry fruit, cocoa, chile pepper, port additions and more. None were pétillant; some could have been considered semi-sweet. A few in Varietal – Semi-Sweet were pétillant. I later had a suspicion that at least two were B. Nektar products I had tasted before in Chicago. Descriptors such as “Michigan tart cherries” or a honey varietal known to be from Michigan were heavy hints. Later google searches for ingredient and treatment combinations, some very specific (strawberry; rhubarb; orange blossom honey), allowed me to confirm the commercial names for a small number that I judged (it should go without saying that none of this knowledge was present at the time of judging). For the home competition, final scores by each pair of judges must be within 5 points of each other. For the commercial competition, a trio of judges must have scores within 10 points. Balance in flavor, mouthfeel and aroma is key to a high-scoring mead; fruit, herb and spice additions should be noticeable, complimenting rather than dominating the honey character. Sweetness, alcohol, body, acidity, and flavor and aroma should all be balanced. My personal favorite was a semi-sweet Capsicumel which had the richest honey expression of the many I sampled, with a full body and moderately quenching acidity, finished by a lively chile pepper heat (though neutral chile flavor). I made my case for best-in-show for Special Open Category Sweet but alas it was picked second for the category behind a rosé-colored mead made with cocoa. My motivation to volunteer for the judging panel was driven by recent interest in BJCP certification qualifications, a desire to know more about the evaluation environment at sanctioned events, and a general desire to learn more about mead making. The professional producers taking part in the competition represent almost the entirety of commercial mead-making in the United States, and I feel lucky to have learned so much from them and other veteran judges in two short days.